With the Department of Veterans Affairs slowly imploding financially, and burdened with a bloated bureaucracy capable of serving only about one third of our veterans, it is time for new ideas and new systems to ensure all our veterans get the care and benefits they have earned. To accomplish this, access to benefits and health care needs to be improved. In its struggle to achieve financial stability with a looming $3 billion shortfall, the VA has been shifting funds and cutting back on expenses while warning Congress that the demand for services will continue to climb as it has during the past year. Much of the increased demand is being driven by the cost of outside doctors, which veterans can now choose to see through the new “”Veterans Choice Program” if they cannot get a VA appointment within 30 days. Accordingly, the VA says its waiting lists of one month or more have increased by 50 percent over the last year when the problems plaguing the agency first came to light. The VA has hired more doctors and nurses and expanded access to care, but the number of veterans seeking care has multiplied beyond expectations. We are seeing that throwing taxpayer funds at an agency with a bloated bureaucracy won’t work. I believe we have to simplify the process and work together with the VA and other agencies in easing access to benefits and health care so that we can reach 100 percent of our veterans. One solution is a computerized benefit card that allows every veteran to have all benefits and health needs listed in one account. At Soldier On, when a case manager goes out into the community to meet with a homeless veteran, one of the first things they do to begin the road to permanent housing is to ensure that the veteran has applied for and is receiving all due benefits. If not, it can be a cumbersome and time-consuming process going agency to agency with the veteran to register. But it needs to be done because it is a necessary step to ensure that our veterans are able to get the services they need so they can get back on their feet for good. With an automated benefit card, every veteran who files with the Internal Revenue Service would receive one identification card listing all the veteran’s benefits and medical needs, whether it be pharmaceutical, psych/social, or financial. It would eliminate the need to register for everything, to be at the VA constantly, and to drive to various medical centers and social service agencies. It would also bring consistency and a bit more dignity to the whole system of medical and financial benefits for veterans. The beauty of this system is that it allows every veteran to access his or her benefits all day, every day, eliminates embedded barriers, and facilitates the timely deliverance of benefits. Veterans in need of services would receive their needed support promptly, without many of the delays and encumbrances that come with the current system. When a veteran puts on a uniform, he or she is saying that they were willing to sacrifice their lives for us if necessary. They deserve the best care and attention we can provide. ITHACA, N.Y. — Martin Warren pulls what looks like an identity card from his wallet. He is a clean-cut, slender man dressed in a brown tweed jacket. He wears thin-framed spectacles. He places the card on the table between us. There is a photograph of someone: Barely recognizable underneath a long, unkempt beard and wild, matted hair. “State of Connecticut, Department of Correction, Inmate Identification Card”, it reads. The man pictured on the card is Warren, although it is impossible to tell. 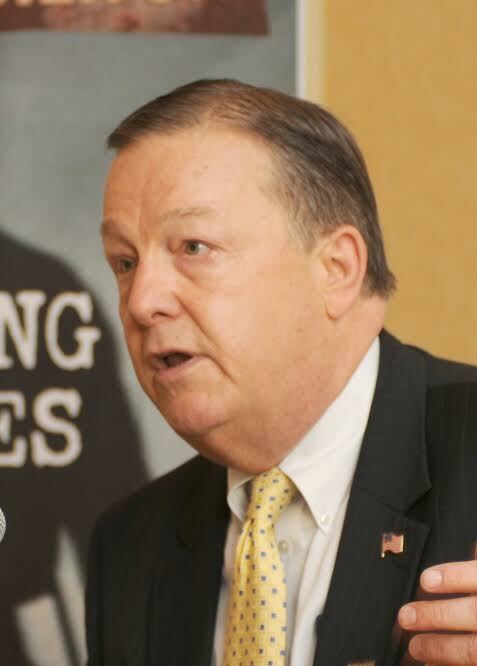 Warren is part of a team from the largest non-profit for veterans, after the US Department of Veterans Affairs, which came to meet with the Ithaca Voice in June to talk about its work in Tompkins County. Five members of Soldier On, including Jack Downing, the CEO, travelled four hours from Massachusetts to Ithaca. We talked about Hope on the Homefront and how we could link the series with the work they do for veterans in our area. Of the 20 outreach workers that work in Central and Eastern New York, 15 of them are formerly homeless veterans, including Warren. 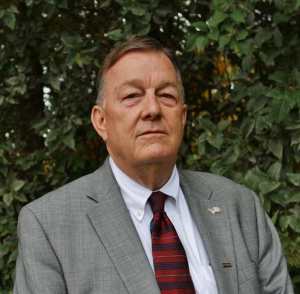 Warren had been a Navy specialist officer from 1973-1977, and was one of the soldiers to deploy on the first Nuclear Task Force in Naval history, but he had ended up destitute. In 2006 he had met a man called Willie Ledbetter, who was working for Soldier On, in a homeless shelter. That man was to prove to be his savior some months later. Warren’s eyes briefly glassed over with tears. Blinking hard, he returned the ID card to his wallet. Soldier On, founded in 1994, deals specifically with homelessness and veterans in crisis, although it runs several other services. At the simplest level, it gets homeless veterans off the streets and into shelters, hospitals, clinics and addiction treatment centers. In New York State there are 21,147 homeless veterans, including 846 homeless women veterans, according to data from the VA. 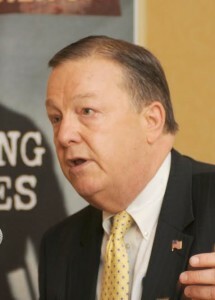 Downing says that Soldier On now serves 18 counties in Central New York – including ours – and 18 counties in Eastern New York. At the meeting was Martin , Dominick Sondrini (formerly a Marine) and Tyrone Byrd (a Vietnam era veteran) all of them local outreach workers for Soldier On. We discussed the issues that face rural veterans: homelessness is not just an urban problem. Warren serves the Ithaca area and travels 1,200 miles in his RAV-4 car, which is equipped to operate as a mobile office. The business model for Soldier On is designed to reach the veteran anywhere they are – something that has made the agency hugely successful: so much so they were awarded $12,757,000 in VA Supportive Services for Veteran Families (SSVF) grants in 2013 to expand their services further across the East Coast and beyond (36 counties in eastern upstate and central New York, 36 counties in central New Jersey, 23 counties in western Pennsylvania, 5 counties in western Massachusetts and over 70 counties in Mississippi). Warren is tasked with helping those in dire need: he goes to homeless shelters, jails, under bridges and is on the road at 6am every morning. He could be up in St Lawrence County and then down by the Pennsylvania border – a distance of 250 miles – all in one day. There are 10 outreach workers like Warren who serve our area. And 10 in Eastern New York. Locally, Warren works with over 50 different agencies, partnering with organizations like the Tompkins County Department of Social Services, Loaves and Fishes, and OAR (Opportunities, Alternatives and Resources). “We build support systems and networks around veterans that just do not have the resources that they need.” Simply put: if you are a veteran in crisis, or you know a veteran in crisis, you call Warren. Willie Ledbetter – something of a celebrity among the veteran community up and down the East Coast – found Warren in a shelter in 2006. Ledbetter was once a homeless veteran too. 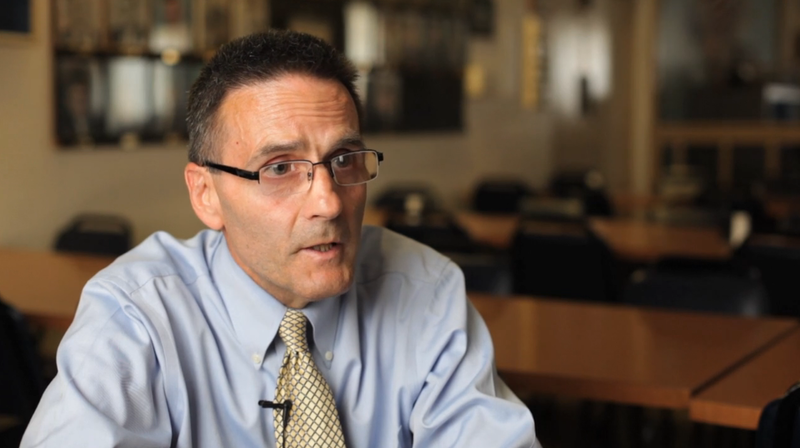 Over the years he has helped thousands of veterans across New York and beyond. He is well-known among the veteran activists in Ithaca. There were, before the initiative, 21 homeless vets in Binghamton. The VA estimates there to be nine in Ithaca. Why do veterans end up homeless? According to data from Soldier On, in Tompkins County, the median income is about $51,000 a year, but for veterans the median income is approximately $25,000. It’s a pretty simple process to get help, says Warren. Call the helpline, and leave contact information. So far, the number of veterans helped by Soldier On in Central New York is 564 – with 721 in Eastern New York. The total number of individuals (including veterans and their family members) served in the 36 New York counties by Soldier On is 2,156. Of the 180 total employees at Soldier On 92 of them are formerly homeless veterans. Part of the weakness of veteran-specific services, experts say, is that they are highly centralized. “It’s a county office somewhere, it’s a VA hospital or outreach center,” says Downing. Downing and his team decided that the best business model was to make the staff highly mobile. They put everyone in all-wheel-drive cars, with a GPS, and computers and cellphones. Warren was at Soldier On for around six months in 2008. He went through its shelter and treatment program. He then was appointed as a “resident-staff” member, and then a committee member. Then he was hired as an outreach worker. He just completed his studies to become a “Credentialed Alcohol and Substance Abuse Counselor” (CASAC): he wants to broaden the services he can offer each veteran. Life has, he says, come full circle for him. Nathan Hanford, artist in residence for Soldier On, was recently chosen to be among Berkshire Magazine’s “The Berkshire 25” for 2015. Hanford was honored with other award winners at a reception held at The Mount in Lenox, MA on August 28. 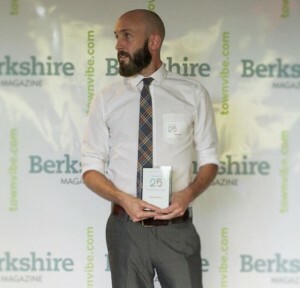 This is Berkshire Magazine’s second year of honoring a “select” group of individuals for their work in improving and enhancing the Berkshires, which the magazine characterizes as the most dedicated, most creative and most influential persons in their fields. The Berkshire 25 “touch upon the various elements of the Berkshires that make us unique, and they work to improve and enhance our home and its diverse features,” the magazine stated in announcing the winners. “It is his full-time work as artist in residence and case manager of Soldier On that is really admired by locals,” Berkshire Magazine stated. Nathan has been a member of the Soldier On staff since October 2013. A multi-skilled artist, Nathan has been able to inspire participation in his group through a flexible arts curriculum in which he brings materials used by the veterans to explore various disciplines of their choice, from painting and drawing to woodcraft and embroidery. Through exercising their creativity, Nathan believes veterans and others can become better equipped to combat the daily struggles of life.